When I did the final batch of set ups for Melbourne and put the map up on the site, I figured that was the end for (Un)seen Sculptures. I planned to bid it a fond farewell then move on to other projects. Since then, however, parts of it have duplicated, mutated, and moved on to occupy new and unexpected venues… So, I figure I should start maintaining a blog to keep anyone who’s interested abreast of its movements. In about a month, a half dozen or so (Un)seen Sculpture works will migrate north to take up residence on the Esplanade in Cairns, as part of the Cairns Festival. (More on that later..) And last week, my work – The Information Virus – was reworked and included as one of the works in reverse=Bread.from(crumbs), a show at the At The Vanishing Point Gallery in King St, Newtown, Sydney. I got 12 very different responses to this call out that included material as diverse as poetry, music/noise compositions, elliptical multi-layered ruminations, humorous radio pieces, a declaration about the legal rights of Muslims in New South Wales, and field recordings of a juice seller in Palestine, a restaurant in Cairo and a Tel Aviv beach memorial to a pirate radio peace activist. The exhibition is on till August 7, so come down and check it out if you’re in the area. 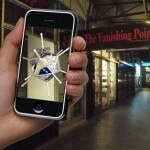 On Saturday around 2pm, I’ll be there presenting a talk on how to make your own mobile augmented reality art.